Craig Blacklock grew up with camera in hand, traveling along with his father, the pioneering color nature photographer, Les Blacklock. Craig's early work took him to the national parks of the American West to photograph mountain scenery and wildlife. Since the early 1980's he's focused his vision on Minnesota and the Lake Superior region. 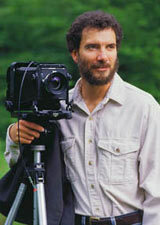 Like his father, Craig works primarily with a 4x5 inch view camera. An ardent conservationist, Craig hopes his images will inspire people to protect the finest landscapes of the region (particularly the North Shore of Lake Superior) from further residential development. He co-founded Blacklock Nature Sanctuary and was instrumental in establishing the Lake Superior Water Trail of Minnesota. In 1996, Craig began shooting for a book of black & white nudes on Lake Superior. It was during this time that he met a young woman named Honey, who agreed to model for him on this project. She soon became the focus of the project and agreed to write an essay for the forthcoming book. Honey and Craig fell in love while working together and were married in 1999. They had a daughter in 2001. A Voice Within — The Lake Superior Nudes was published in 2004. Copyright © 1997-2004 New Age Publications, LLC. All Rights Reserved.